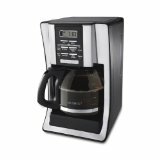 AWESOME Bargain with 60 k cups included! Deliciously simple® in less than 60 seconds! Everyone’s taste in coffee is different. You love dark roast while your spouse prefers light roast. Your best friend drinks decaf, your next-door neighbor drinks tea and the kids want hot cocoa. With over 200 varieties of coffee, tea and hot cocoa to choose from, Keurig® makes it possible for everyone to brew their own perfect cup in less than a minute. Unlike conventional coffee makers, there’s no coffee to grind or measure, no coffee pots to clean and no soggy filters to throw away. 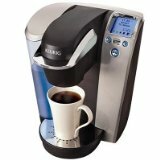 The gourmet Keurig® Ultra K75 single serve coffee system offers easy one-touch brewing with four brewing sizes, an advanced programmable LCD control center, 24-hour digital clock and removable drip tray. Includes a bonus pack of 60 K-Cups® variety pack plus one My K-Cup reusable filters. Each K-Cup is sealed air-tight for freshness and is available in over 150 varieties of name brand gourmet coffee and teas to meet the most demanding taste profiles. All coffees available are 100% Arabica beans.